On the blog today is a recipe that has become a family favorite in our house!!! I have to be honest, I was kind of surprised… you see, I have been working on incorporating Einkorn into our regular diet, but einkorn has a kind of learning curve, as it behaves differently than modern wheat, etc… (more on that later!) 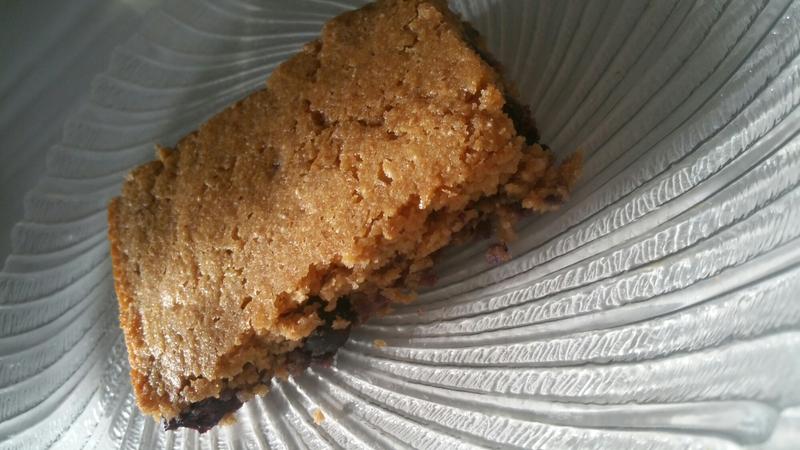 Anyways, back to my story, during the week I try to do breakfast meals for our children that have as little sugar in them as possible, although this does not include naturally occuring fruit sugars, and I came across the original recipe HERE for these bars while searching Pinterest for inspiration. I made them once, and the hubby even tried them, and they were so simple and easy, and such a hit that I made them again and doubled the recipe, and hubby even stopped in his tracks and came back to get some on his way out the door to work, so I knew they must be pretty good! 3. Mix the dry ingredients together in a separate mixing bowl. Gently fold in blueberries, if using frozen, keep them in freezer until you are ready to add to the mixture. Bake for 30-35 minutes, or until a toothpick inserted into the center comes out clean, and the edge are a little browned. I hope you and your family enjoy them as much as mine does! I will be posting links soon to share my sources for the cheapest whole grain Einkorn I have found thus far! Thanks for stopping by! Next Post My Favorite Places to Shop for Good Food at a Great Price!